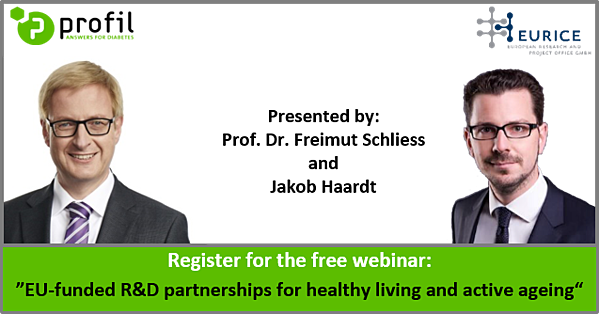 Free Webinar: "CGM based outcome measures"
"EU-funded R&D partnerships in healthy living and active ageing"
Insights from Prof. Dr. Freimut Schliess, Director Science & Innovation at Profil and Jakob Haardt, Research & Innovation Manager at Eurice. In this webinar, Jakob Haardt and Freimut Schliess will focus on the opportunities for innovators posed by participating in EU-funded project consortia. Starting with a concise overview of existing funding opportunities, application procedures and IP management, participants will be given the chance to learn from first-hand experience in setting up new collaboration schemes and coordinating innovation consortia of partners from industry, research and academia. In a time when chronic diseases account for 86% of deaths and 77% of the overall disease burden in Europe such consortia are greatly needed in order to allow for true innovation and successful commercialization of solutions to the problems that will threaten our wealth and health in the future. In the context of the demographic transition and ageing European societies, this group of diseases creates a tremendous challenge for national healthcare systems. These recent challenges call for investment in innovative products and services that promote healthy living and active ageing and thus help to increase the health-related quality of life and extend healthy lifespans. Implementation of the UN Sustainable Development Goals related to health and well-being, quality education and partnering will be of key for achieving sustainability in the provision of high quality healthcare in Europe and globally. On the other hand innovators need to overcome several barriers to the marketing of innovative products and services. Under the umbrella of Horizon 2020 and the upcoming research and innovation framework programme Horizon Europe, the European Union addresses key societal challenges by supporting innovators from different domains to create real benefits for citizens, societies and the economy. Jakob Haardt built up his competences in the fields of scientific project coordination and proposal writing as a Research Associate at the Federal Highway Research Institute and EC Liaison Officer at the Technical University the European research and innovation management company Eurice, he set his personal focus on innovation development and exploitation strategies for life science projects in Horizon 2020 as well as strategic Berlin. Having joined alignment and proposal management within the public-private Innovative Medicines Initiative (IMI). Prof. Dr Freimut Schliess is a biochemist by training, teaching molecular medicine at the Heinrich-Heine University of Düsseldorf (Germany). As Director Science & Innovation at Profil GmbH, he is responsible for the exploration of new business opportunities. Freimut is representing the company within the EIT Health knowledge and innovation community and coordinating the CLOSE EIT Health innovation project about the implementation of closed-loop control feedback control in the management of patients with type 2 diabetes.